Cadbury has been sharing Joy in South Africa for 80 years and they will commemorate this milestone by celebrating their legacy with the generosity that chocolate fans have come to know and love about the brand. Instead of keeping their amazing birthday gifts – they will be giving them away in an exciting digital campaign called ‘Cadbury Remarkable Regifts’. Cadbury fans will be able to select a gift on the ‘Remarkable Regifts’ website (www.remarkableregifts.co.za) in order to stand a chance to receive it at the end of the campaign. Those who spotted the Truckload of Joy that arrived in Johannesburg on 4 September will have noticed the exciting variety of gifts that Cadbury received - and will be regifting. Every gift is special to Cadbury - from the most elaborate to the simply sentimental. 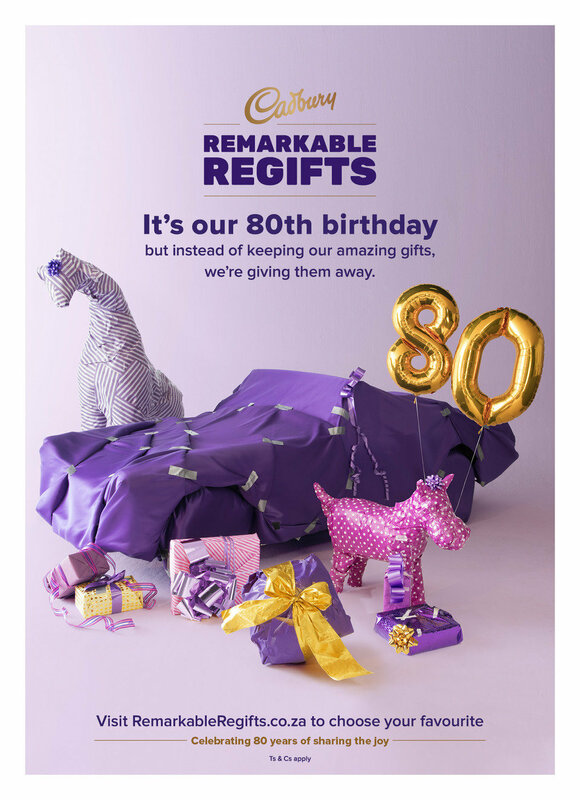 Birthdays are a time of celebration and giving – and as a generous, heritage brand, we thought it was a fantastic opportunity to celebrate our 80th by giving back to our consumers. They’ve been an integral part of our journey, and as such, we felt that there was no better way to acknowledge 80 years of loyal support than by regifting what we have received. To select a gift, Cadbury fans can visit RemarkableRegifts.co.za. Visitors have a month to select their favourite mystery gift, with all gifts set to be revealed digitally on the 1st October, in typical ‘surprise and delight’ Cadbury style. The 15th October will be the official Remarkable Regifts Day where all the lucky recipients will be announced. Selection of these lucky recipients will be through an audited, random draw. Visitors to the site can select any gift that they prefer but won’t know exactly what it is – apart from the odd clue - until the big reveal. In the end, it’s all a surprise – as all birthday gifts should be! But don’t worry, if you’re not sure about your odds during the campaign period, you can change your selection to another gift at any time before the closing date of 30 September. Do this as many times as you wish, but remember, in the end, you can only choose one gift. The RemarkableRegifts.co.za website is accepting your selections from now until the 30th of September. All gifts will be revealed early October. T’s&C’s apply. To find out more about Cadbury history, visit www.cadbury.co.za/the-story, or connect on Facebook at @CadburyDairyMilkSA and @Cadbury_SA on Instagram and Twitter. Cadbury Dairy Milk fans can also look out for the range of commemorative 150g wrappers in stores during September, with 8 different wrappers showcasing the brand’s packaging design transformation through the ages. Celebrating 80 years of sharing the Joy.